In my last article, I outlined four things that had me concerned/the Penguins needed to change in order to win Game 5. Since you lovely people have inexplicably read the several hundred word articles I churn out EVERY SINGLE DAY for going on two months, I can only assume you know how Game 5 went for the Penguins (SPOILER ALERT: they annihilated the Predators, 6-0). CONCERN #1: MATT MURRAY WASN'T PLAYING PARTICULARLY WELL. WERE MY CONCERNS VALID IN GAME 5? Uh, he posted a shutout, so, um, no. To be fair, the Predators rarely challenged Murray (I'd say that he was forced to make two above-average stops, which given his shutout, he clearly did), but Murray played well above the .902 series save percentage he was toting entering the night. While I stand by my premise– that replacing a goalie with a .902 save percentage isn't comparable to asking Donald Trump to actually read his daily national security reports– I was pleasantly surprised that both Matt Murray and the head coach that stood behind him had more gumption and moxie than I did. "WHOOOOOOPS!" Who is this masked man wearing #65?! CONCERN #2: RON HAINSEY HAD BEEN PLAYING PARTICULARLY AWFUL. WERE MY CONCERNS VALID IN GAME 5? 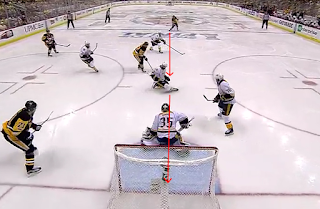 I say this sans hyperbole: Ron Hainsey likely had the freaking GAME OF HIS LIFE in Game 5. DID YOU SEE WHAT I SAW?! RON. HAINSEY. SCORED A GOAL. I have never been so wrong about a person, event...ANYTHING...in my entire life. 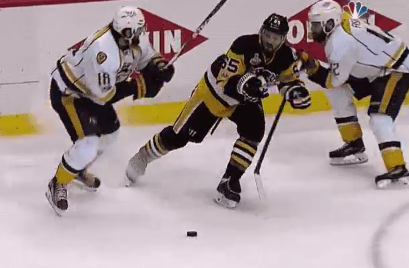 CONCERN #3: THE PENGUINS' POWER-PLAY WAS U-G-L-Y. ...Justin Schultz scored the rare 10-hole goal (a double 5-hole through a defenseman and through Pekka Rinne) to give the Penguins both a power-play goal and a very early 1-0 lead. This is a bad goal in every sense of the word "bad." While the Penguins would subsequently go 0-for-5 with the man-advantage, they once again proved my fears to be unsubstantiated, and dropped my hockey observations to a miserable 0-for-3. CONCERN #4: THE PENGUINS' BREAKOUT SYSTEM WAS AWFUL AND NEEDED CHANGED. WERE MY CONCERNS VALID IN GAME 5? Yes!! Finally, I was right about something! ...and yet, only kind of. Pittsburgh was much more committed in their collective effort to clear its own end of the ice, and they were able to move through the neutral zone with relative ease as a result. The Penguins deserve commendation for their efforts, but Nashville made it awfully easy too. The Predators were overwhelmed by the Pens' early push, and the Preds are not a team that's built to orchestrate comebacks. Absolutely nothing that Nashville did worked: they backed off and gave the Penguins room to skate, and that's just an awful idea that showed in the 6-0 final score. Without a doubt, the Predators will do everything to clog up the middle of the rink later tonight, so expect a slogfest of the worst degree, especially if the men in stripes refuse to call the game accordingly. SO ALL IN ALL, A LOVELY .250 SHOWING, OR ONLY MARGINALLY WORSE THAN PEKKA RINNE'S PERFORMANCE AT PPG PAINTS ARENA THUS FAR IN THE FINALS. I could go on and on...and there are parts of me that want to write 5,000 word diatribes to the emergence of Sidney "You Know What, F--- This" Crosby (about time, really), I'm content to save that for the off-season, which I hope will begin in approximately 12 hours. Get excited, get pumped. This is easily the Golden Age of Pittsburgh Penguins hockey, and nothing in life is guaranteed. Go Pens.